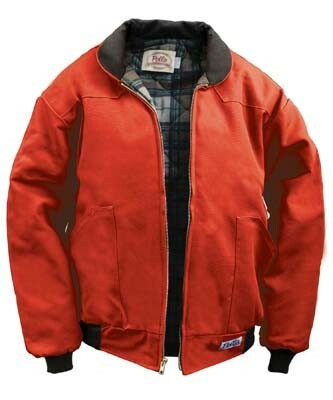 This jacket integrates style, warmth, and durability. Made of 10 oz. all cotton duck fabric outer shell, and lined with a plaid flannel quilted to 6.6 oz. Hollofil insulation. Quilted nylon sleeves for easy on and off. Western yoke front and back. Has rounded corduroy collar and 100% stretch nylon knit cuffs and waistband. Sturdy brass front zipper. Machine washable. The Basic Duck Cap is a great match for this jacket. This product in Made in the USA at our New Sharon, Iowa factory.